A couple of years ago, Mark and I were mountain biking near State College, Pennsylvania. We began our ride from a parking area in Penn Roosevelt State Park. I'm not sure if Mark's car was the only car there when we began our ride...but for some reason, as we wrapped up our day on the trails, I took notice that it was. With the bikes on top of the car and with less sweaty clothes on, Mark and I walked down below the parking are to explore the near empty lake and the dam that contained it. I remember Mark walking towards the lake and I headed out to the dam. All around me I saw empty picnic tables and signs put up by the DCNR which were meant to educate the public on the plant life and wildlife which is native to the area. 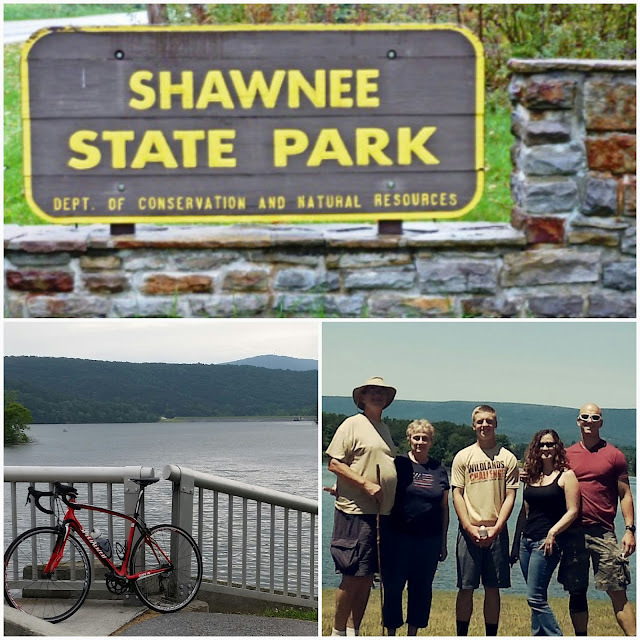 My mind raced back to my childhood and the amount of time my family spent at Shawnee State Park in Bedford County and Ohiopyle State Park in Fayette County. Memories of picnics, charcoal grills, hiking, exploring, and family time. Again...the realization that our car was the only one there came to the front of my head...and I asked, out loud, if people still made use of the state parks like we did 20-30-40 years ago. Was this park always this empty now...or is it possible that we just happened to be there late in the afternoon on a Tuesday? 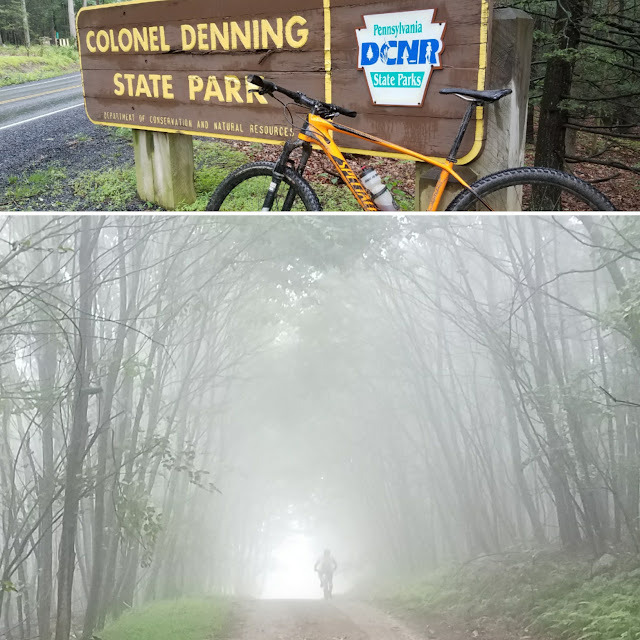 If you live in Pennsylvania then there's a pretty good chance that you are currently within 50 miles of one of the Commonwealth's 121 State Parks. I'm not sure if that is most in the nation...but it's got to be near the top. 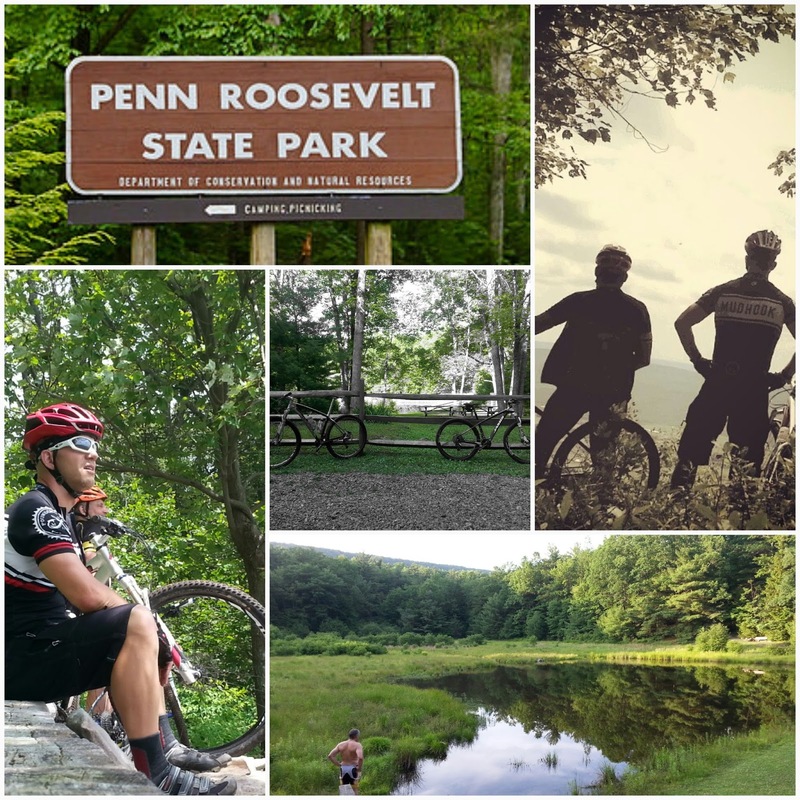 Combined, Pennsylvania's State Parks offer over 200,000 acres for hiking, camping, picnicking, fishing, hunting, wildlife watching, and yes....mountain biking! From my house in Manchester, PA, I'm only 18 miles from Sam S. Lewis State Park, 22 miles from Gifford Pinchot State Park, 24 miles from Codorus State Park, 52 miles from Swatara State Park, and 57 miles from Pine Grove Furnace State Park. That's pretty cool! This map shows you the 4 regions in which Pennsylvania is divided and the locations of Pennsylvania's State Parks. Click HERE to access the DCNR website that will help you locate a State Park near you! 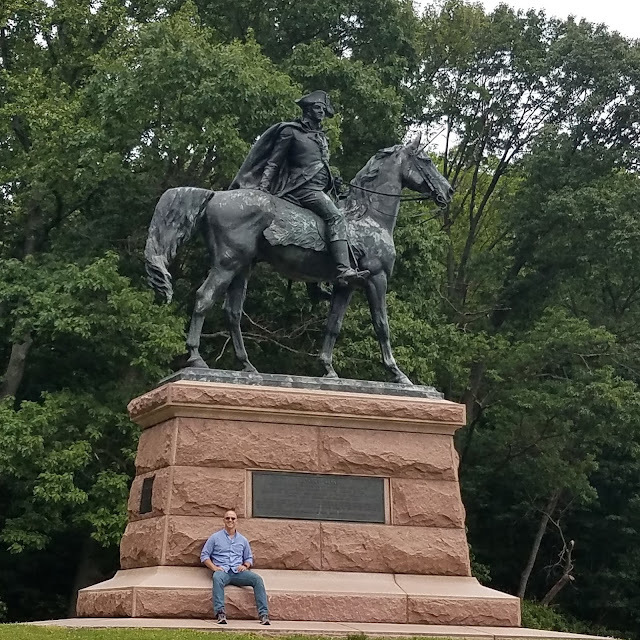 Valley Forge State Park (now Valley Forge National Historical Park) was the first state park in Pennsylvania. In 1893, Pennsylvania's governor, Robert E. Pattison, signed Act 130 "for the acquisition of ground at Valley Forge for a public park." This act also created a commission that would work to acquire more land for public use. In the early 20th century, Joseph T. Rothrock headed the Commission of Forestry. As a medical doctor and a forester, Rothrock set up camps in the parks for people suffering from respiratory illnesses. Following the Great Depression, the Civilian Conservation Corps established 113 CCC camps in Pennsylvana (2nd only to California) and, along with helping to fight fires and build roads, helped to create many of Pennsylvania's State Parks. I have no trouble remembering the first time Mark took Timmy and I to Michaux...Memorial Day weekend 2006. After a hard mountain bike ride we passed through an extremely crowded Pine Grove Furnace State Park (I can still remember salivating when we pedaled through the smell of the hotdogs cooking over charcoal grills). I dare you to try to find a parking spot near the Natural Water Slide in Ohiopyle State Park on a Saturday or Sunday! Go ahead, just try to find an empty camp site anywhere in Pennsylvania on Memorial Day weekend. Good luck with that. 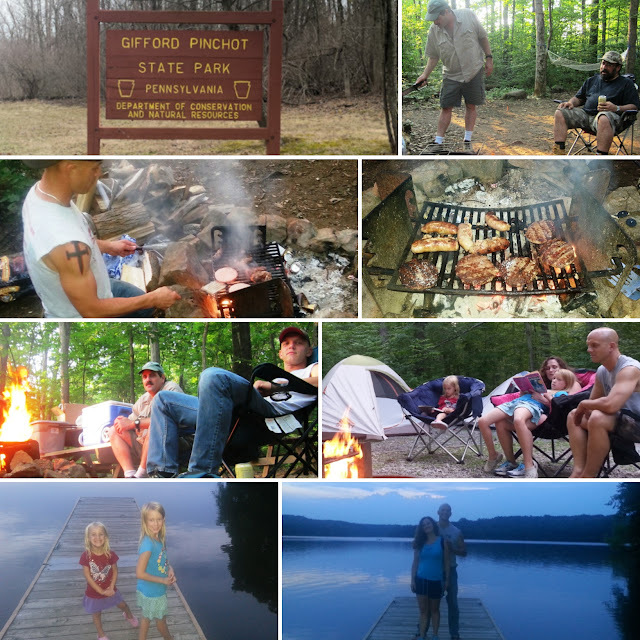 Over the past 40+ years I've been to a bunch of State Parks for a variety of reasons with a variety of people. Here are (in no particular order) all the Pennsylvania State Parks I've been to (so far)*...with a few of my memories attached. Hope you enjoy! 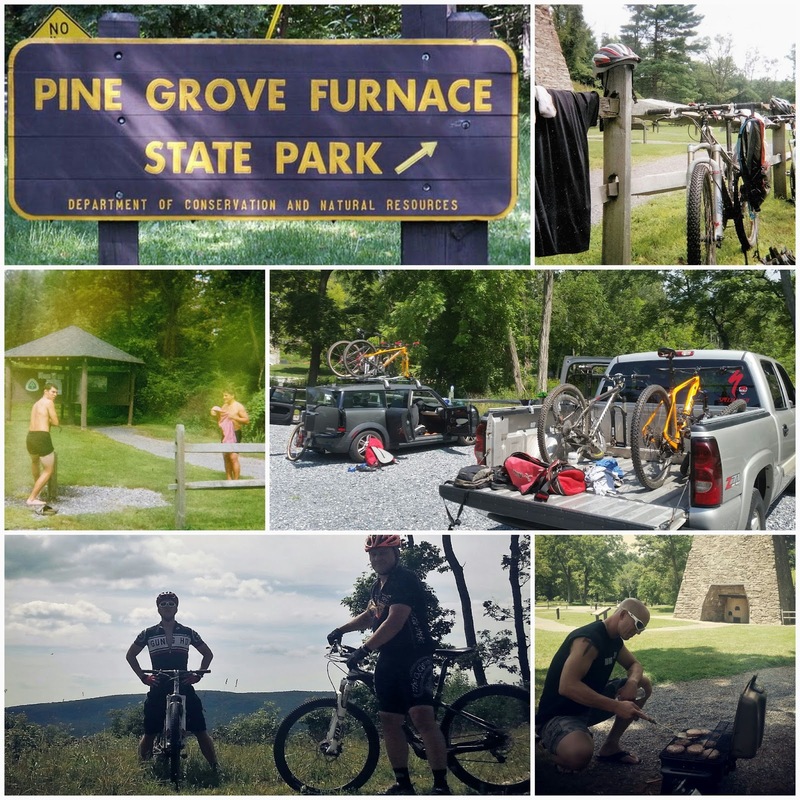 For me, Pine Grove Furnace and mountain biking go hand-in-hand. 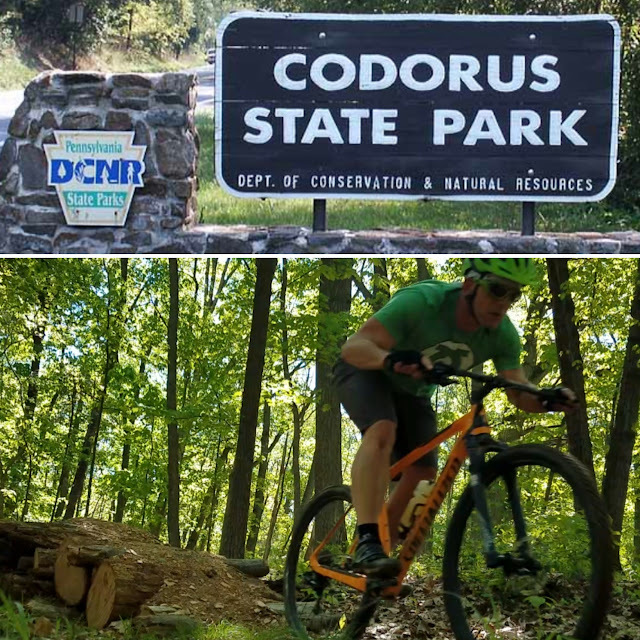 Since 2006, we've used the parking lot and picnic area of the park, as a launching point for 99% of our mountain bike excursions in Michaux State Forest. This 696 acre park is located in an area known as South Mountain (the northern tip of the Blue Ridge Mountains). I'm not sure where to begin! Ohiopyle has been a family tradition for more than 70 years! 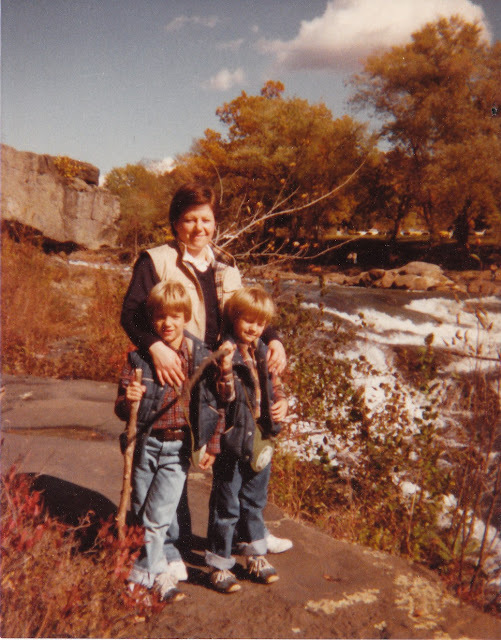 My parents began bringing my brother and I to Ohiopyle when we were very young. I've made a point to continue the tradition and it's become a favorite place for both my wife, and my son. 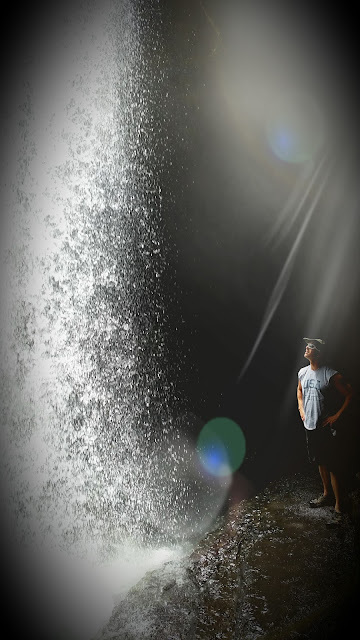 Located on the Laurel Ridge in southwestern Pennsylvania, Ohiopyle State Park is 20,500 acres of pure awesomeness! Hiking, camping, mountain biking, white water rafting...if you want it...it's probably there! To see how much of a family tradition Ohiopyle has been be sure to read PASSING ON OHIOPYLE and OBSERVATIONS FROM OHIOPYLE. 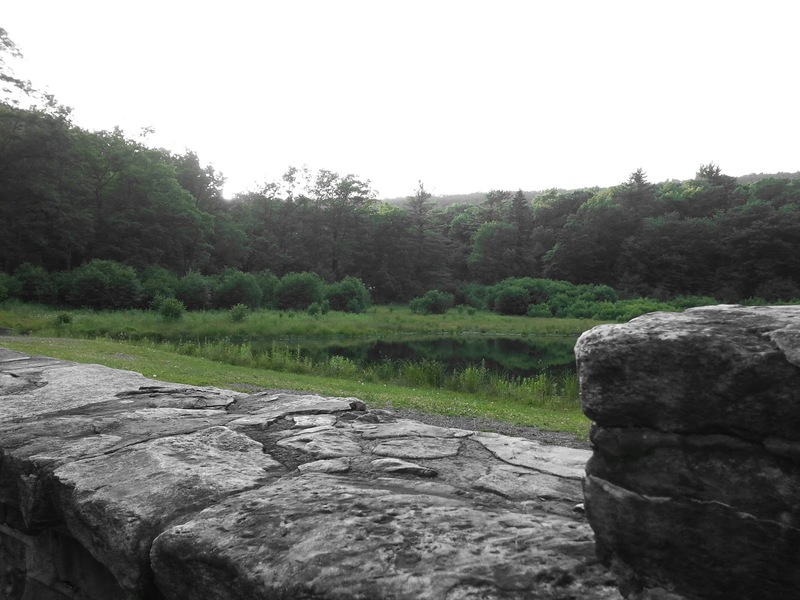 Shawnee State Park is the park of my "growing up in Bedford" childhood. I remember summer mornings, boarding a school bus, and heading out for swimming lessons at Shawnee Lake...the focal point of the the 3,983 acre park. As an adult, I've ridden my road bike out there from my dad's house in Bedford and taken hikes with my wife, son, dad, and step-mom. Encompassing 2,338 acres of land in York County, Gifford Pinchot State Park is ideal for boating, fishing, and camping. I've ridden my road bike through the area numerous times. I've been part of quite a few summer time "teacher debriefings" at Pinchot with colleagues. My wife, Robin, and I also took my nieces Jackie and Sophie there on their first camping trip! ADDED ON DECEMBER 27, 2017 -- Mark Lentz and David Raymond. My first mountain bike ride at Gifford Pinchot State Park. Loved the 20 degree weather! 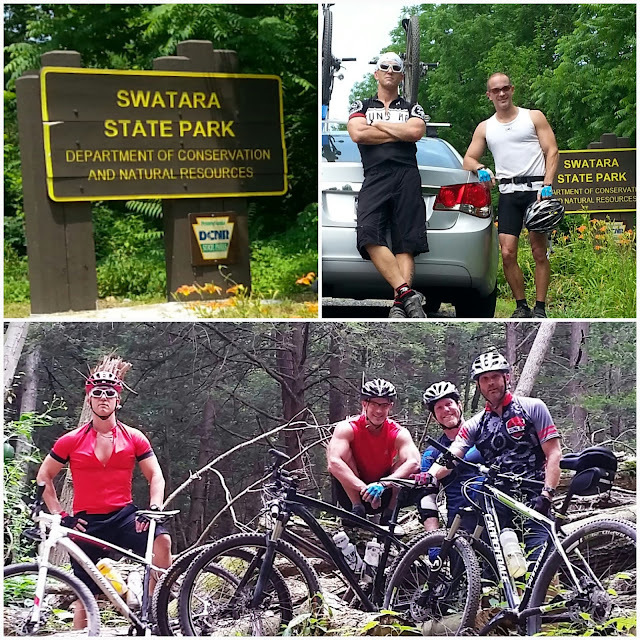 Swatara State Park is a favorite mountain biking destination for the guys in our group. Miles and miles of twisty, turny, fun single track! The 3,520 acres that make up Swatara State Park are nestled in the Swatara Valley north of Harrisburg, Pennsylvania. 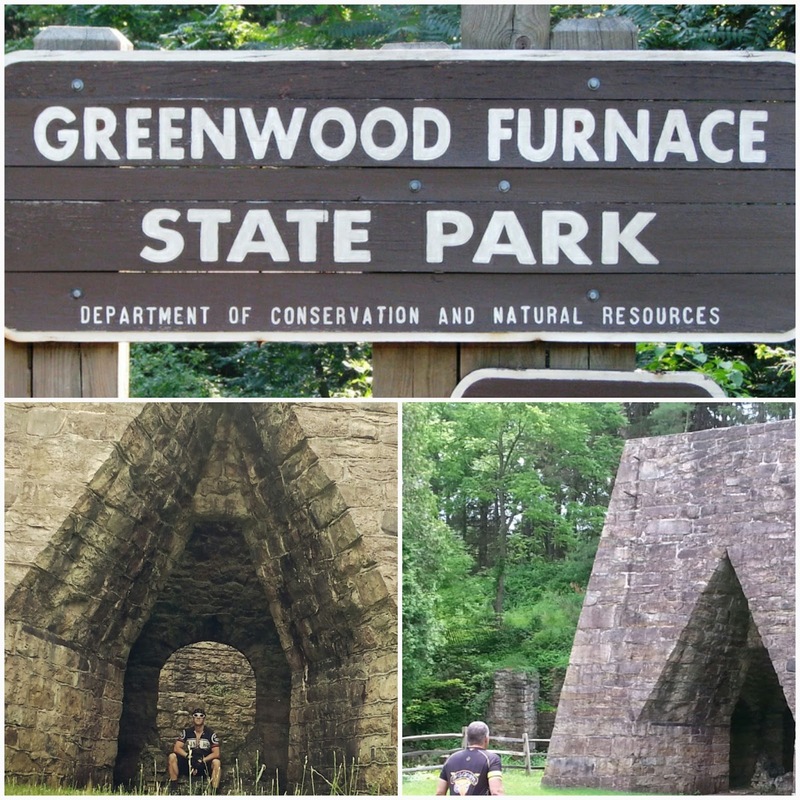 Greenwood Furnace State Park is on the western edge of the Seven Mountains in northeastern Huntingdon County. The park covers 423 acres, including a six-acre lake, campground, hiking trails, and a historic district. The park provides access to backpacking, hiking, mountain biking, hunting, and fishing in the surrounding 80,000-acre Rothrock State Forest. 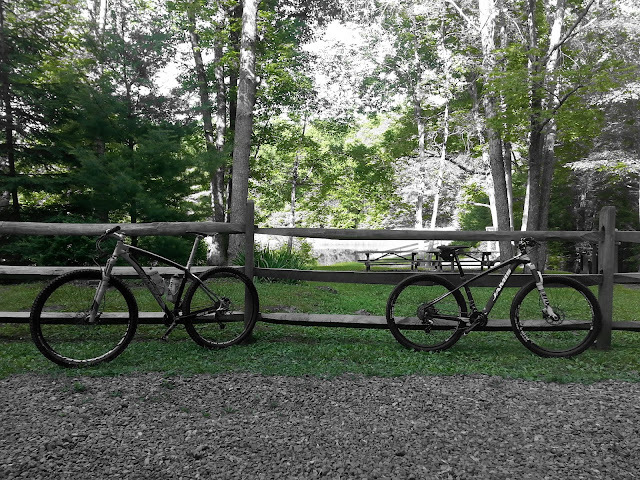 Mark and I passed through the park on multi-day mountain biking trip in the area around State College, Pennsylvania -- June 28, 2014. 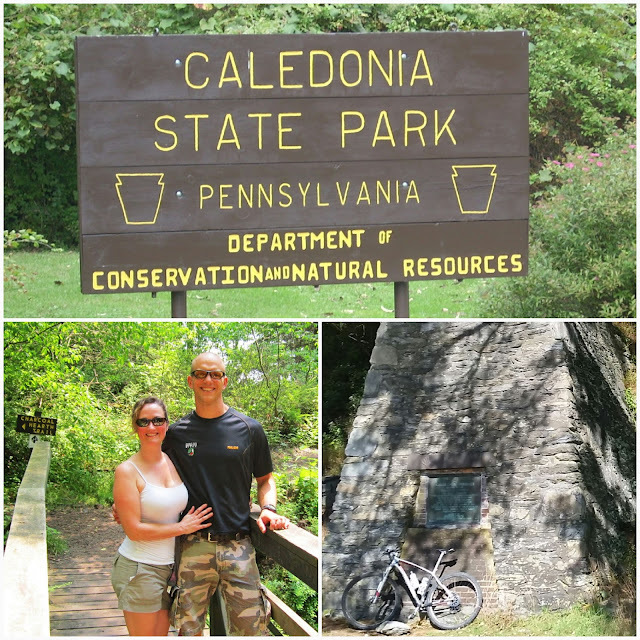 Caledonia State Park straddles Adams and Franklin Counties. The 1,125 acre park is surrounded by Michaux State Forest. Just west of Gettysburg, Pennsylvania, Caledonia is a favorite destination for hiking, camping, and picnicking. 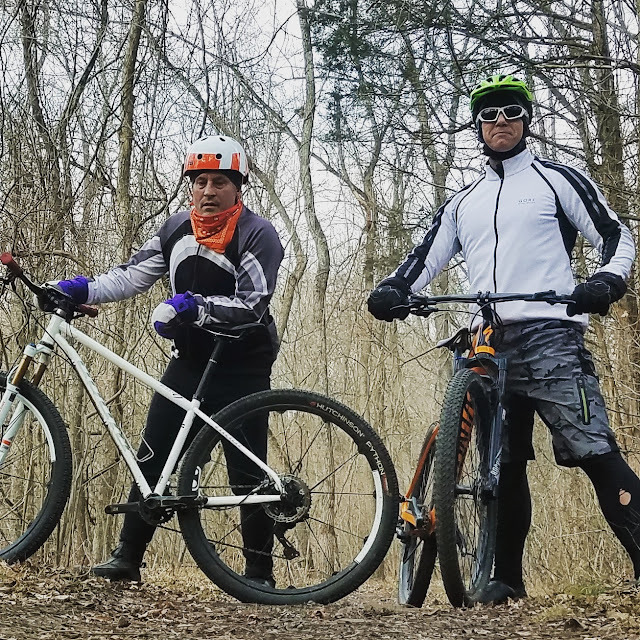 Mark Lentz and I explored the area on our mountain bikes on Columbus Day 2015. I first experienced Trough Creek State Park as a kid. My mom and dad took my brother and I there for a picnic after a day of riding the water slides near Raystown Lake. 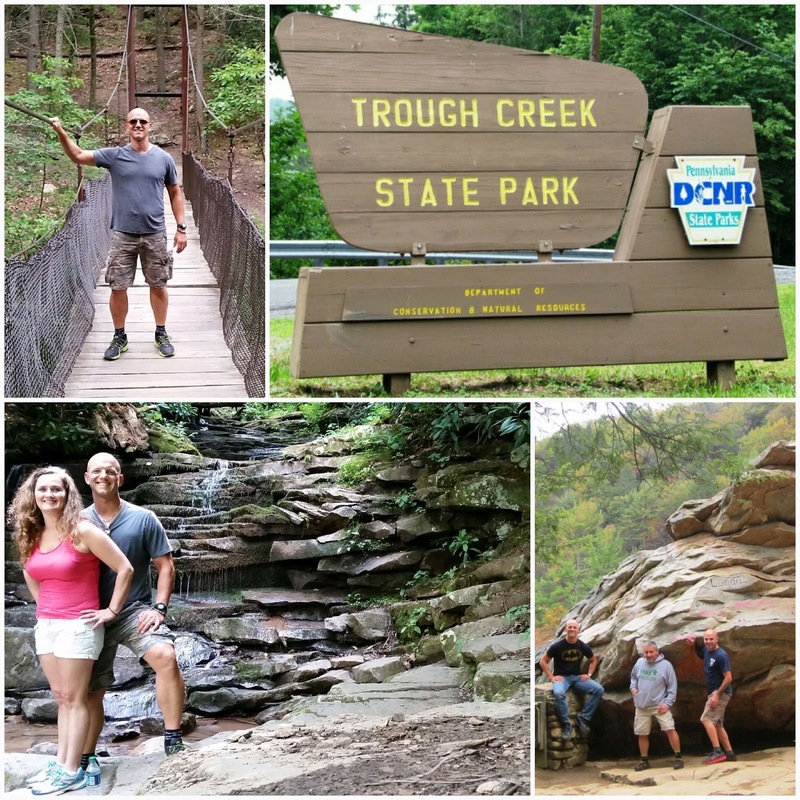 The 541 acre park, which cuts through Terrace Mountain, includes some super kool attractions such as a balancing rock, water falls, an ice cave, and a swinging bridge. I've revisited the park twice as an adult. 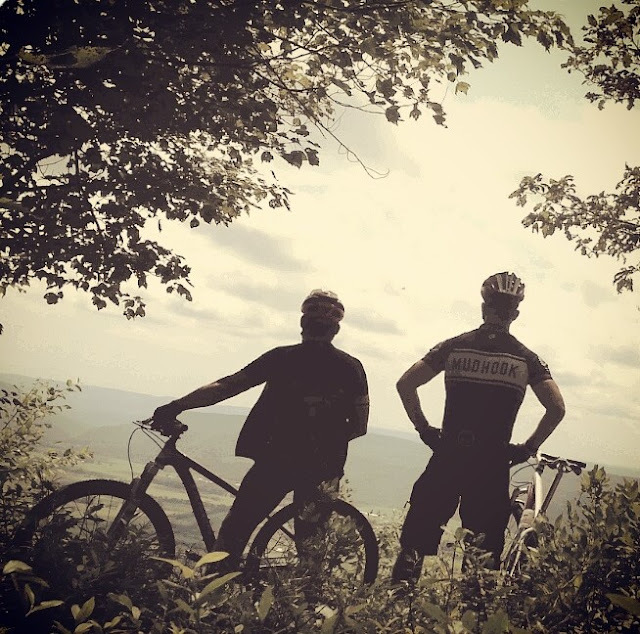 First with Mark and Mikey after mountain biking the Allegrippis Trails near Raystown Lake and then on a brief hiking trip with my wife, Robin. 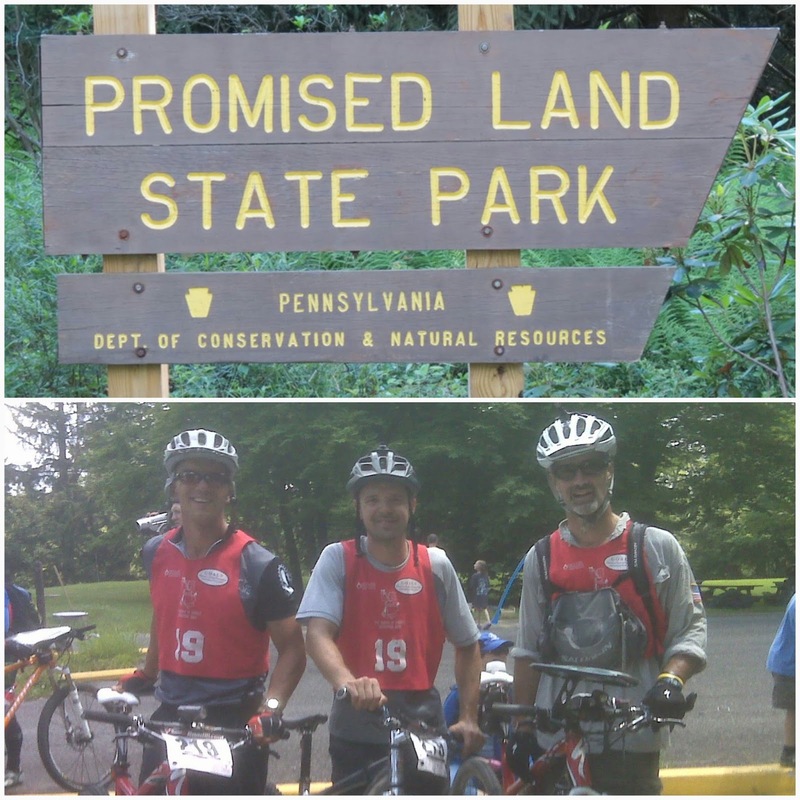 Promised Land State Park includes approximately 3,000 acres and is located on the Pocono Plateau (about 1,800 feet above sea level). I was only there once...and I don't remember much. 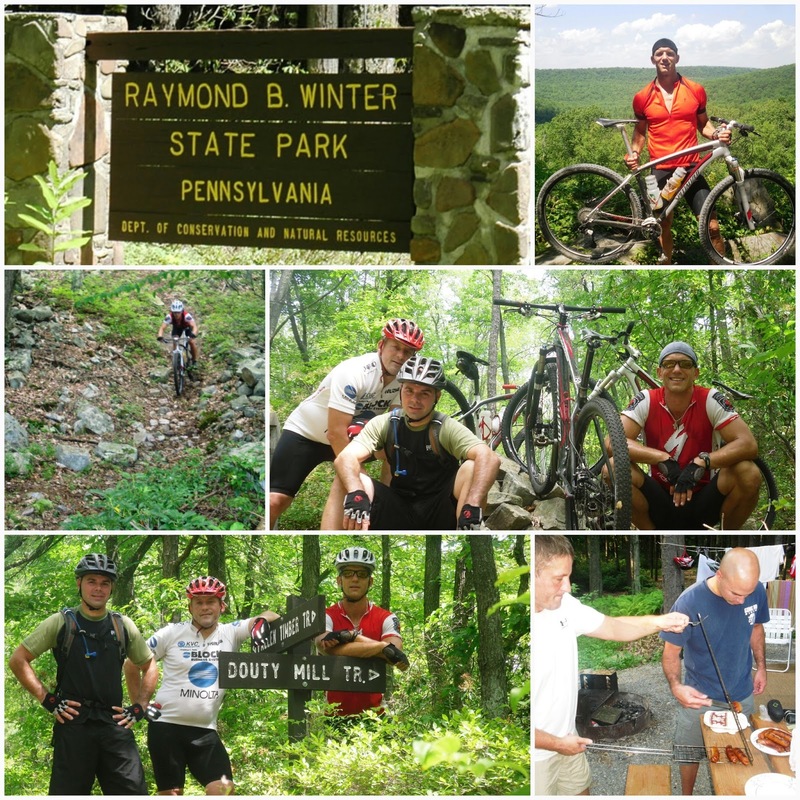 In June of 2009, Kristian Hains, Jay Zech, and I participated in the Cradle of Liberty 24-hour Adventure Race. It began in Promised Land State Park and was one of the toughest events I've ever participated in! 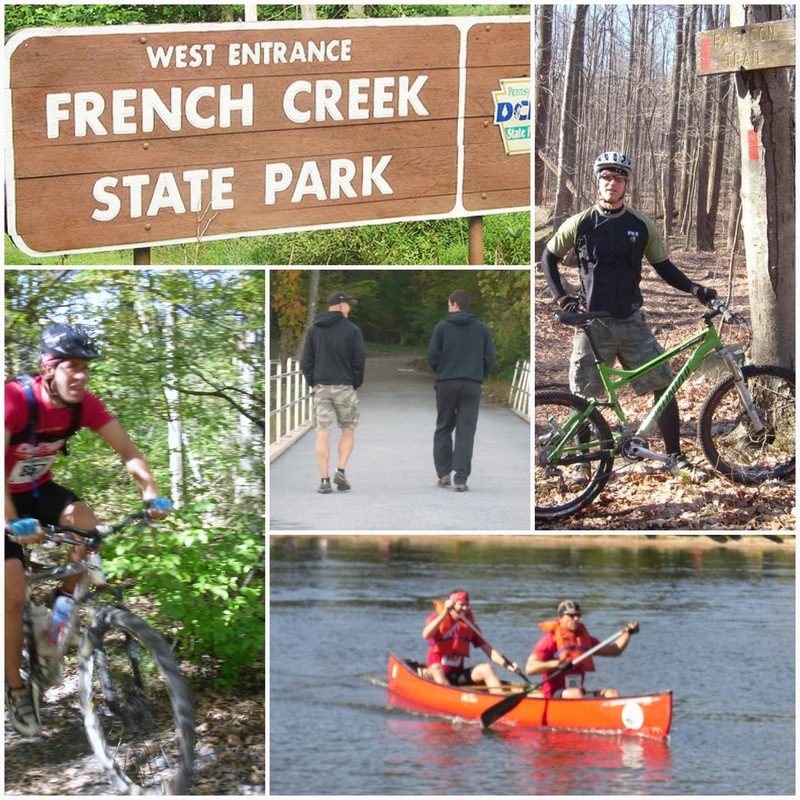 French Creek State Park is the largest block of contiguous forest between Washington, D.C. and New York City. 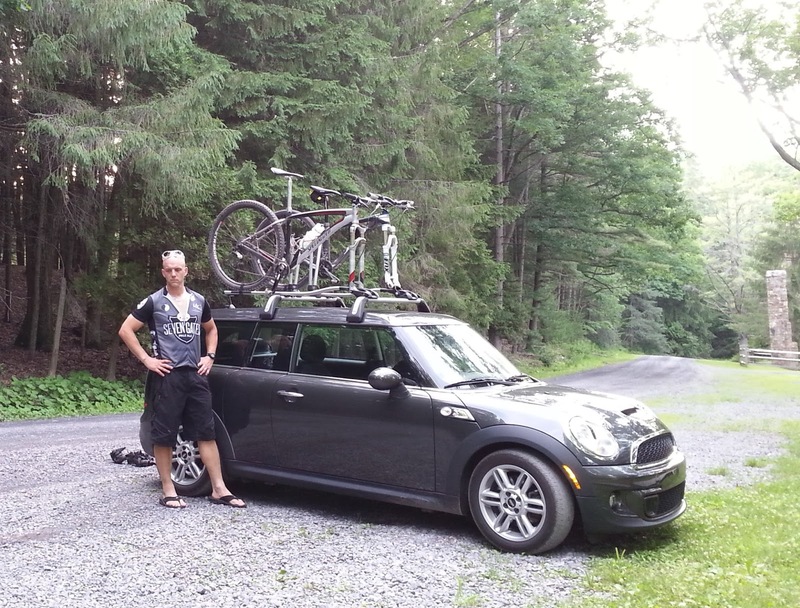 Located in the Schuylkill Highlands, the 7,730-acre park is perfect for hiking, fishing, camping, and biking. The mountain biking in French Creek is some of the toughest around and it was the sight of the French Creek Fling 2-man adventure race. 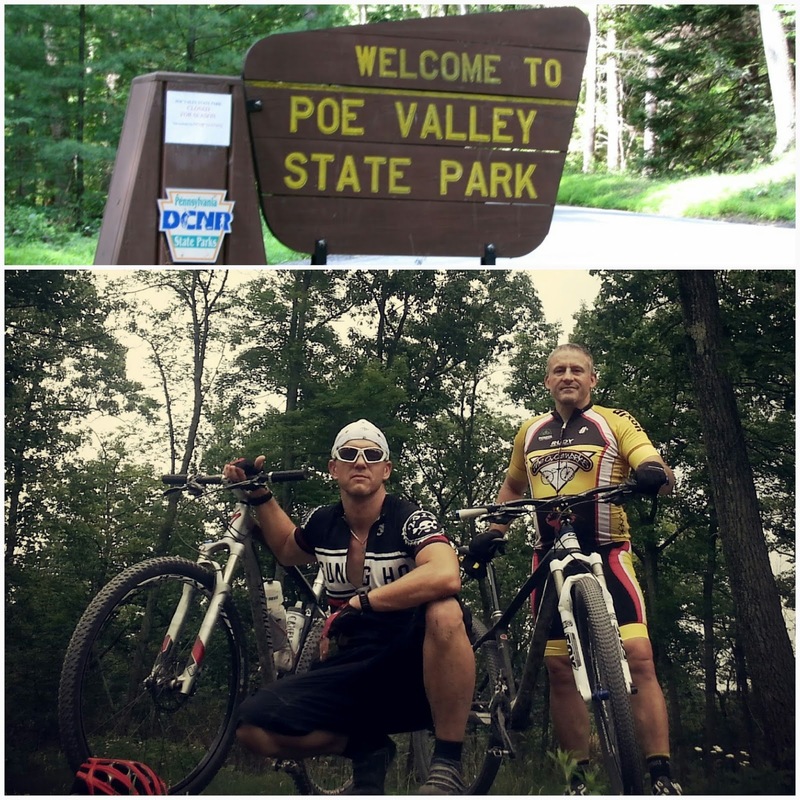 Mark Lentz, Mikey Nardelli, and I spent 3 fun days mountain biking and camping in Raymond B. Winter State Park in July of 2011. This 695 acre park is located within the extreme eastern edge of Bald Eagle State Forest. Okay...this one brings out the complete NERD within me! Buchanan’s Birthplace State Park is an 18.5-acre park nestled in a gap of Tuscarora Mountain in Franklin County. 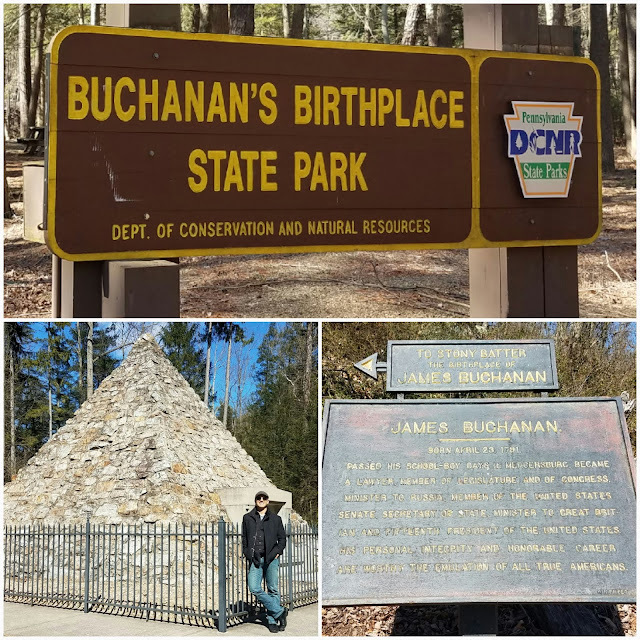 It is the site of the the birthplace of our nation's 15th president, James Buchanan. I visited the park just last week with my wife, Robin, on our way home from my dad's house in Bedford. 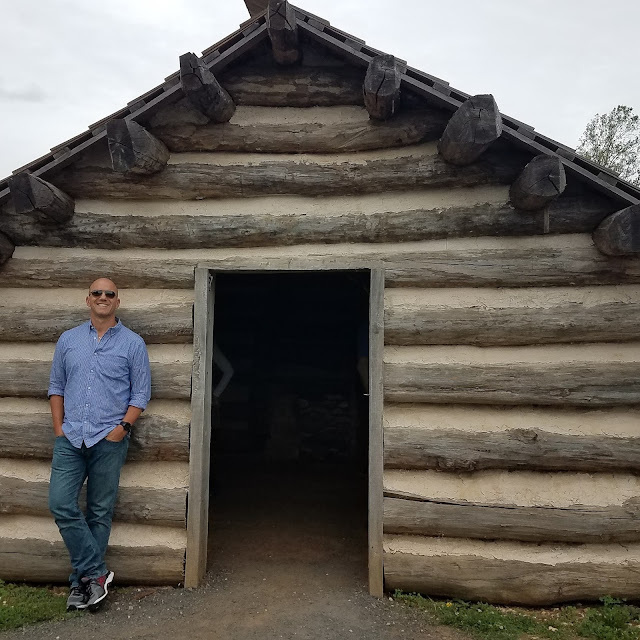 No mountain biking... this small State Park offers picnic areas, trout fishing in Buck Run, and a chance for history teachers, like me, to completely get their NERD on! 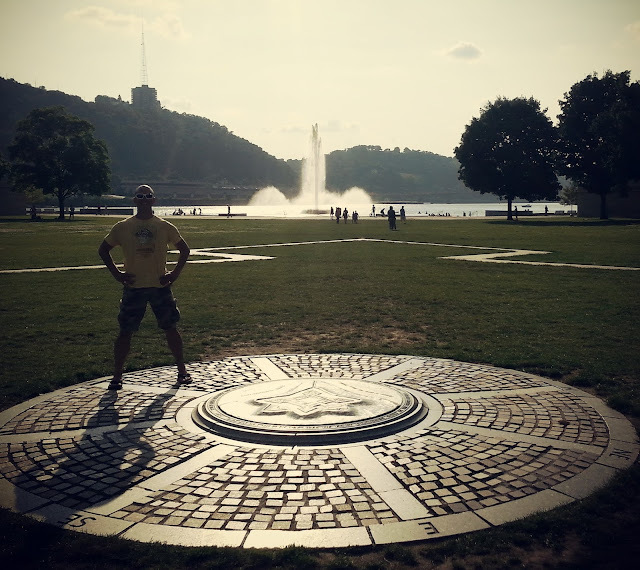 Pennsylvania's state parks have been such a big part of my life. 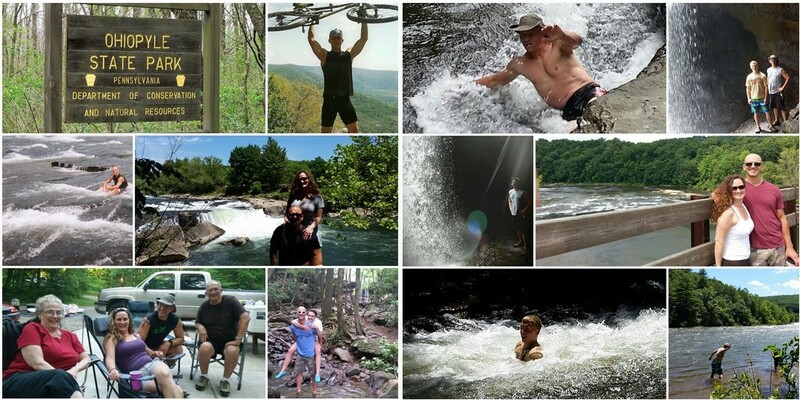 Ohiopyle has been, and continues to be, a family tradition. Shawnee brings back so many childhood memories. Pine Grove Furnace has become, for me, synonymous with mountain biking. The parks are beautiful...they are convenient...and, best of all, they are free to the public (even for all of you out-of-staters)! Today, they are run through the Department of Conservation and Natural Resources. Improvements are constantly being made (yep...no more smelly green bathroom at Pine Grove Furnace). So...whether your thing is camping, or hunting, or hiking, or mountain biking...whether it's with your family, with your friends, or on your own...check out a state park near you. The only money you'll need is for the ice cream on the way home because, in Pennsylvania, the OUTSIDE IS FREE! Be sure to check out HIGHPEAKSHIKING.COM and all my other posts at ALL TRAILS LEAD TO ICE CREAM! *State Parks that I visit after I post this will be added at the bottom. Be sure to come back and check out other parks that I know I will eventually get to!